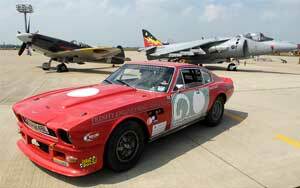 Sponsoring David Such Racing and his distinctive red 1972 Aston Martin V8 is one of Gifford Grant's sponsorship ventures. David achieves impressive results against much larger and better-financed opposition, with minimal resources. This appealed to the directors of Gifford Grant with its very cost-effective structure. Since linking up with Gifford Grant, David has won the Aston Martin V8 Handicap championship, and set new V8 records on both the short and long course at Curborough sprint circuit in Staffordshire. He has also set a new outright record for any Aston Martin at Loton Park hill climb, in Shropshire. Intensive work during the winter keeps the car competitive in the race for points at circuits all round the UK. Occasional track days enable selected clients, not of a nervous disposition, to experience laps of Mallory Park, Leicestershire and Goodwood, West Sussex in a special passenger seat. *The thrill of Goodwood was enjoyed by all of our guests at our Aston Martin Track Day in July near Chichester, West Sussex. Speeds of up to 130mph were recorded, with our tame racing driver only being over taken once all day! Conditions were warm and dry, and both vintage and new cars were trying their luck on the circuit. The 1974 V8 coped extremely well on the day, only suffering with VERY hot brakes due to the speed David was reaching going into the bends. One guest commented, ‘Thank you so very much for Friday. Kate and I enjoyed ourselves immensely. Bring on the speed! !’, and another is currently trying to work out how he can take up competitive driving, continue reducing his golf handicap and keep his wife and family happy! *Our driver, David Such, achieved third place in the Aston Martin Classic Championship. 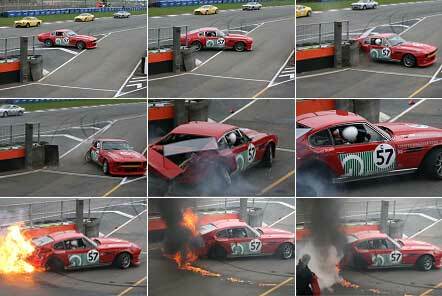 Having led the competition for most of the season, disaster struck at Donnington, Leicestershire in the last race when oil dropped by another competitor’s car caused David to spin 720 degrees and hit the entrance to the pit lane, the car subsequently catching fire. Fortunately, prompt action by our pit crew and some others got David clear of the car, which is now being rebuilt. Watch out for our car next season! "We were very fortunate to have Gifford Grant as our project managers. They brought us a showroom to be proud of and the working environment my team deserves"